Monday February 8th 1904 Still very cold. I was busy with the work a great part of the day. I did a little sewing and read in the evening. Tuesday February 9th 1904 weather a little better. I was busy all morning and in the afternoon went down to Woolfs. I read in the evening. Wednesday February 10th 1904 Was busy all morning with the regular work. I had thought to go to town after dinner but Mother and Alma came. I sewed a little and read in the evening. 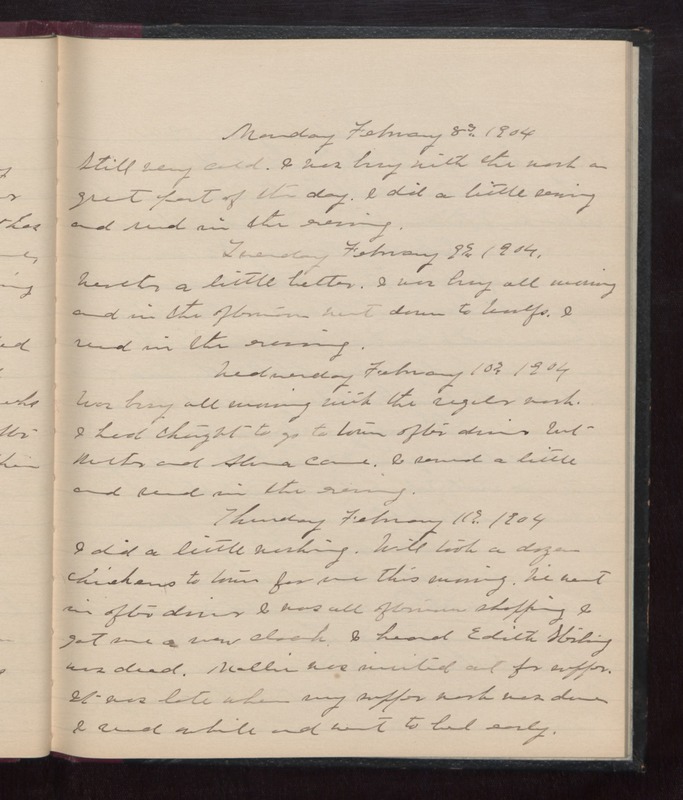 Thursday February 11th 1905 I did a little washing. Will took a dozen chickens to town for me this morning. We went in after dinner. I was all afternoon shopping & got me a new cloak. I heard Edith Sterling was dead. Mollie was invited out for supper. It was late when my supper work was done. I read awhile and went to bed early.